NetEnt is considered one of the key developers of online gambling software in the industry and enjoys an excellent reputation among players and casino operators alike. NetEnt’s games are highly regarded by casino enthusiasts the world over for their unprecedented quality in terms of animations, graphics, interface and gameplay. 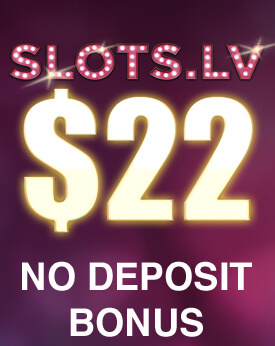 The slots developed by the company enjoy a tremendous popularity which does not come as a surprise as the titles not only boast a number of great special features, but some of them also offer gargantuan progressive jackpots. The Swedish gambling software developer even held the Guinness record for the highest progressive payout for a while, when one lucky gentleman from Finland collected the mind-blowing prize of €17.8 million on a mobile NetEnt slot with the humble bet of €0.25. Read on if you are interested in how NetEnt’s progressive jackpot slots work, how their pools are accumulated and what the Swedish company’s most popular jackpot slot titles are. The jackpots on progressive NetEnt slots accumulate roughly in the same manner the prizes from the lottery do. A smaller percentage of each bet on a given slot contributes to the overall pool which keeps increasing at a rapid pace until someone is fortunate enough to pocket the massive prize. This explains why the jackpots on NetEnt’s slots sometimes skyrocket to seven-figure sums. Some of the NetEnt slots are based on a tiered or multi-level jackpot system, providing slot fans with the opportunity to bag one of several progressive prizes. 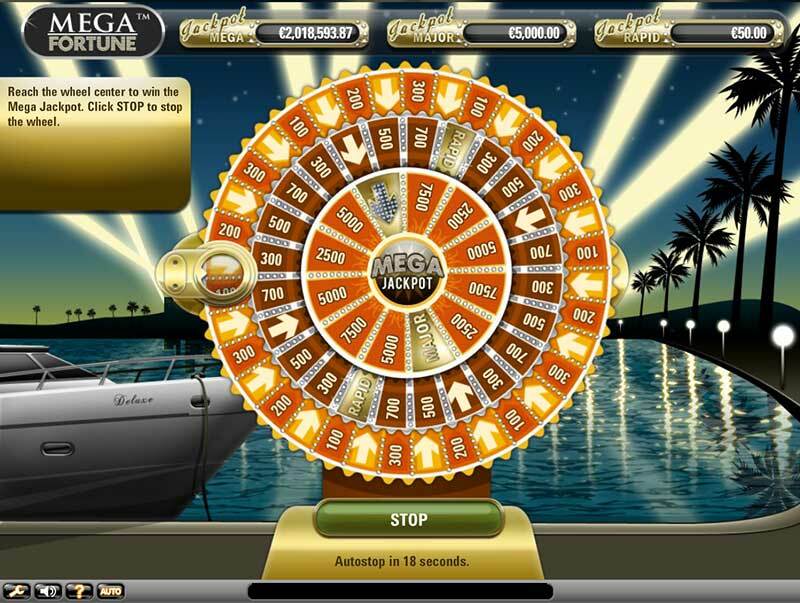 An example would be the popular Mega Fortune slot alongside its variation Mega Fortune Dreams. A small portion of each player’s bet is subtracted and divided so that it can fuel each of the three progressive prizes. In Mega Fortune, in particular, 1% of each bet goes towards the Rapid jackpot, another 1% fuels the Major jackpot and as much as 5.39% of the wager contributes to the accumulation of the Mega jackpot which is the highest prize Mega Fortune has to offer. Players should keep in mind that the higher their stakes per spin are, the greater their chances of triggering the jackpot. To maintain the interest of slot fans after someone wins the progressive jackpot, the pools do not start accumulating from scratch, but from a predetermined seed value which typically varies from one slot title to another. This allows the jackpot to quickly grow back to an impressive sum. An example would be the Arabian Nights slot which seeds at 125,000 credits whenever somebody wins. We can distinguish between two types of NetEnt progressive jackpot slots, depending on how the pools accumulate. The first type of progressive prizes offered by NetEnt are the so-called local jackpots. 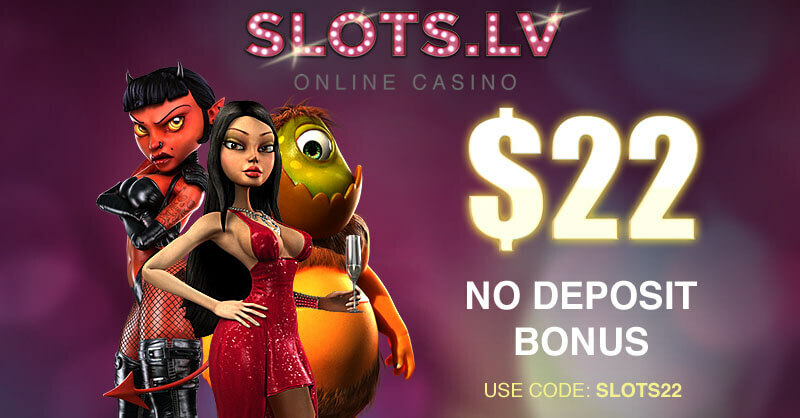 Slots that offer local jackpots have pools that accumulate across a single online casino. The prize increases only when customers of that particular online casino bet on the given progressive slot. Needless to say, the jackpot on such games can be won only from registered members of the particular casino. Because fewer players contribute to the pools, the local jackpots are typically smaller and rarely, if ever, can reach a seven-figure sum. The size of the local jackpot differs from one casino to another. Some of the most popular local jackpot slots by NetEnt include Gold Rush, Cash Bomb and Tiki Wonders. The slot titles that are linked to NetEnt’s progressive jackpot network are in extremely high demand by slot fans because the prizes to be won are much larger. This can be explained by the fact such slots are linked across many different online casino operators and the number of players, who contribute to the accumulation of the prize pools, is much greater. This explains why often the wide-area jackpots escalate to reach millions of credits. Popular NetEnt slots that are linked to the wide-area progressive jackpot network include Arabian Nights, Mega Fortune, and Hall of Gods. Over the years, NetEnt has launched a nice range of quality slot titles that offer lucrative progressive jackpots. If you are interested to know which titles offer the highest average progressive jackpots and how the massive prizes are triggered, we suggest you take a quick look at the five NetEnt slots we have reviewed below. Mega Fortune must be the most popular progressive title in the entire NetEnt portfolio, which is hardly surprising considering the fact it previously held the record for the biggest progressive jackpot payout in the world. The game offers 25 paylines spread across five reels and boasts a fun theme that was obviously inspired by the lifestyle of the wealthy. Some of the symbols you can encounter on the reels include speedboats, limousines, champagne bottles and jewel-studded wristwatches. If you take a closer look, you may notice that even the Spin button is studded with diamonds. 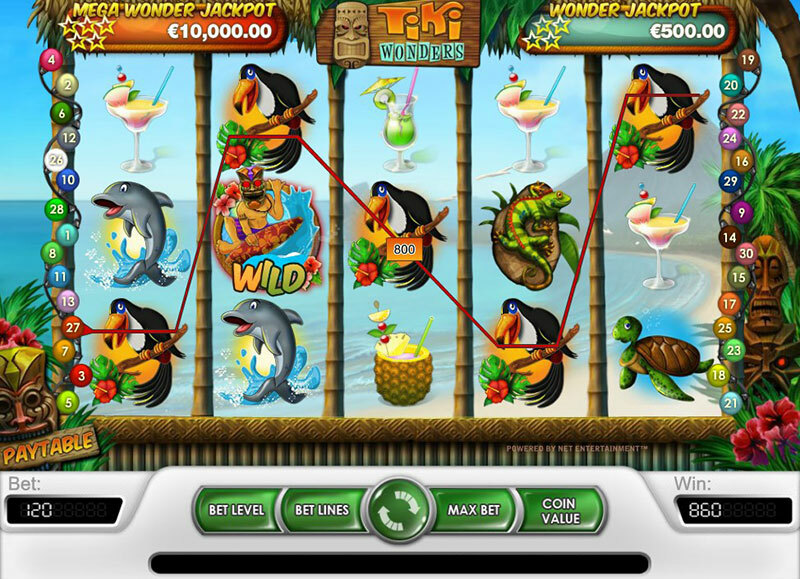 In addition to the phenomenal graphics and sound effects, players will benefit from various special features the likes of rounds of free spins, scatters and wild symbols. This enticing slot offers a three-tier jackpot as there are three different progressive prizes to be won – the Rapid, Major, and Mega jackpots. Since the Mega jackpot is pooled across all casinos that have added the game to their catalogues, the prize tends to escalate to a colossal sum rather quickly. In order to win one of the three prizes, players are required to land three bonus symbols across one of the active paylines. This would trigger a Wheel-of-Fortune type of bonus game as players will see on the screen a wheel that consists of three circles. The aim is to get to the innermost circle of the wheel and spin it. If the wheel stops on the diamond-studded arrow, the Mega jackpot is yours. 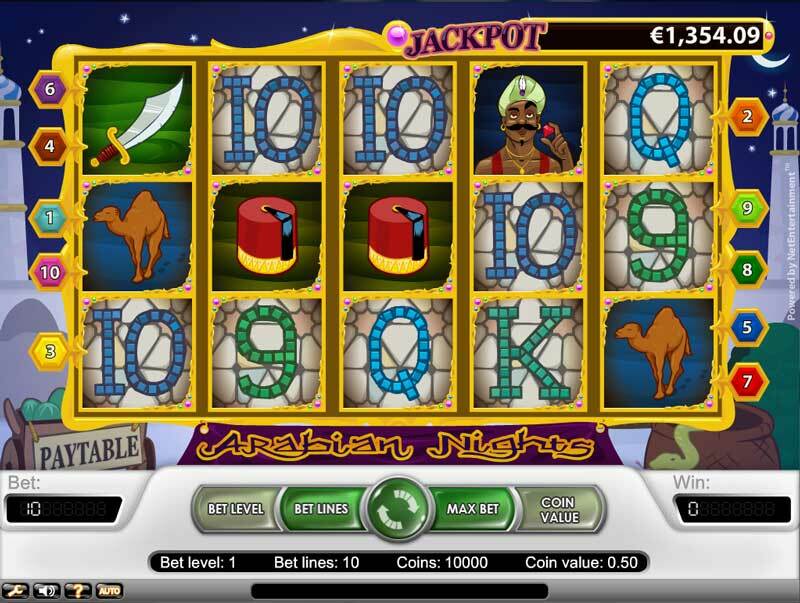 Arabian Nights is another popular NetEnt slot that gives players with a chance to pocket a huge progressive jackpot. The name itself indicates what to expect from this Arabian-themed slot, played on five reels with 10 paylines. The reels are filled with various symbols that relate to the Arabian theme, including camels, daggers, fez hats, genie lamps and marquees. The lowest paying symbols are represented by high cards as usual. When it comes to special features, players can brace themselves for scatters that trigger up to 15 free spins with 3x multipliers on all wins and a wild symbol that can either earn them the hefty prize of 10,000 coins or award them the progressive jackpot. In order to collect the progressive prize, one is expected to line up five Arabian Prince symbols on one of the active paylines. However, in order to qualify for the huge prize, you need to stake the maximum amount allowed per spin, which is £5.00 in this game. If your goal is winning a life-changing progressive jackpot, specifically, you should definitely give the reels of NetEnt’s Hall of Gods slot a spin. 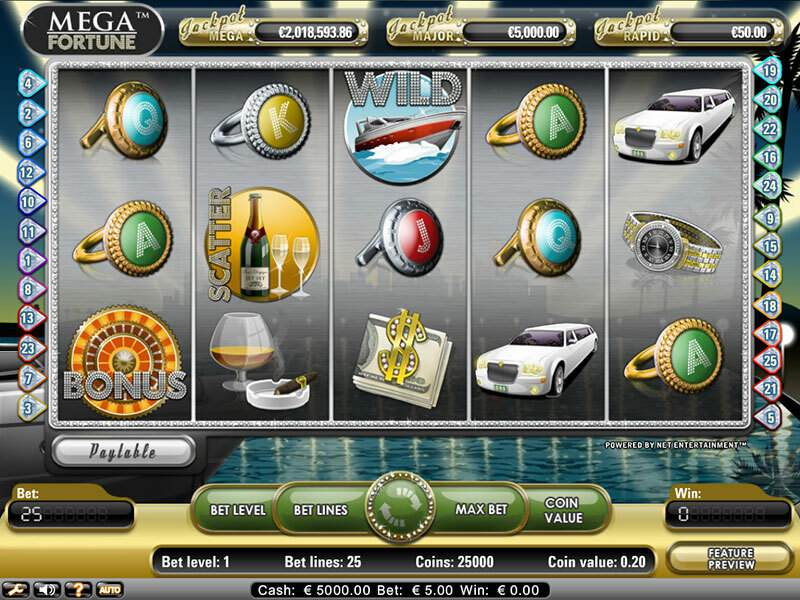 The game features a total of 20 paylines spread across five reels. As the Hall of Gods was obviously inspired by the Scandinavian mythology, various Norse gods and goddesses, like Odin, Loki, Thor, Idun and Freya, will appear on the reels to help players form winning combinations. The above-listed deities are, in fact, the highest paying symbols in the game. Hall of Gods does not lack in features. The Midgard serpent wild can expand to cover an entire reel and thus, enable players to form more winning combinations. The scatter is the game comes in the form of two ravens. Players, who land three, four or five raven symbols on the reels, will be rewarded with 10, 15 or 20 free spins, respectively. 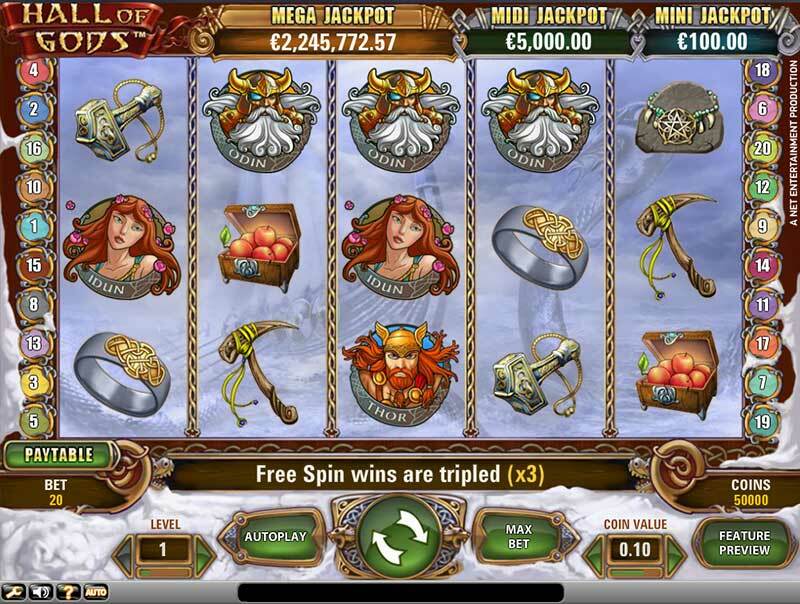 However, the symbol all players aspire to is the hammer bonus symbol because three of those lining up on the reels will activate the bonus game, which can potentially result in winning one of the three progressive prizes – the Mini, Midi or Mega jackpots. In the bonus game, players will see fifteen shields. You are required to break the shields with Thor’s hammer. If they match three of the cash prizes, you will win the corresponding amount of credits. However, if players uncover a shield that hides one of the three jackpots, they will collect the respective progressive prize. 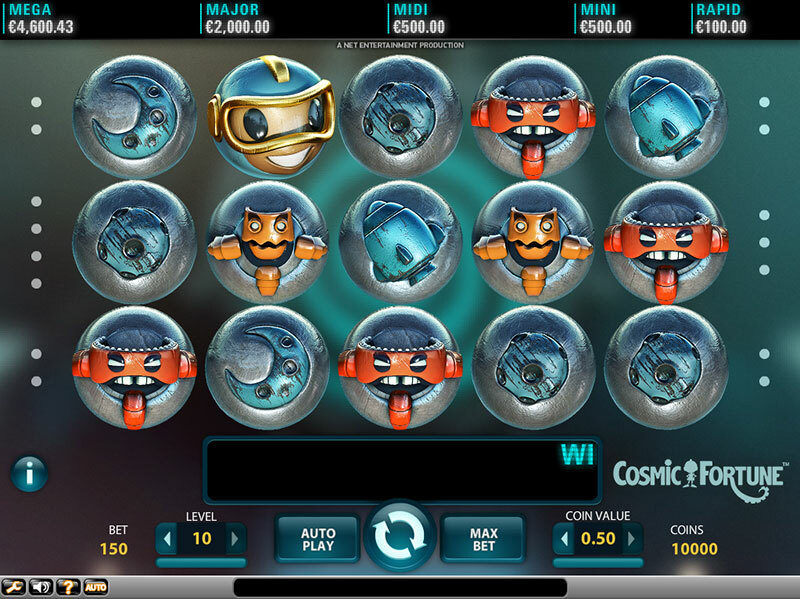 Cosmic Fortune is a fun space-themed, five-reel slot that has a total of 15 paylines to offer. What is more, this title truly stands out from the other jackpot slots, because it offers a five-tier jackpot system, which spans five different prizes. The Rapid and Mini jackpots are fixed (at £100 and £500 respectively) while the Midi, Major and Mega jackpots are progressive. 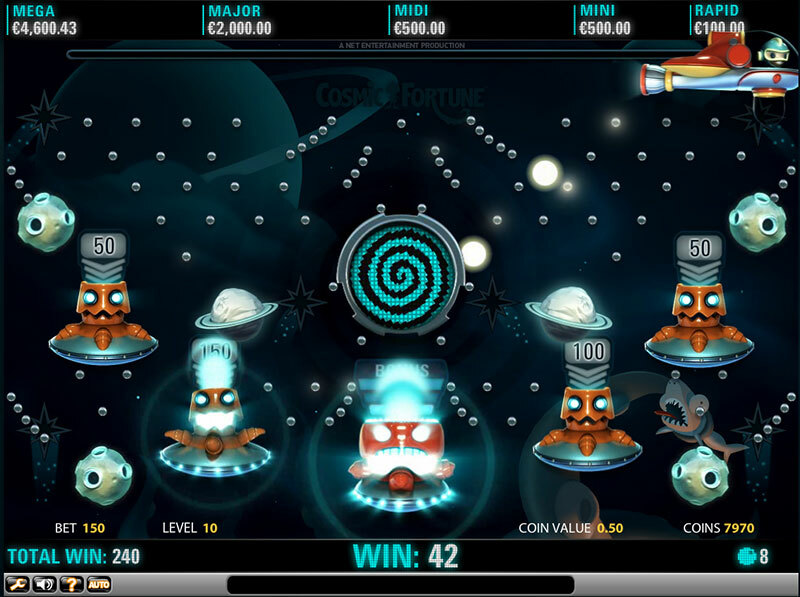 When it comes to special features, it would be fair to say Cosmic Fortune is out of this world, if you would excuse the pun. Players, who opt for this NetEnt slot, can expect scatters that activate up to 10 Free Falls and two different bonus games. One of those is actually the jackpot bonus game, which is based on the Pachinko, pinball-style game that is popular in Japan. The jackpot game can randomly reward players with one of the five prizes on offer. 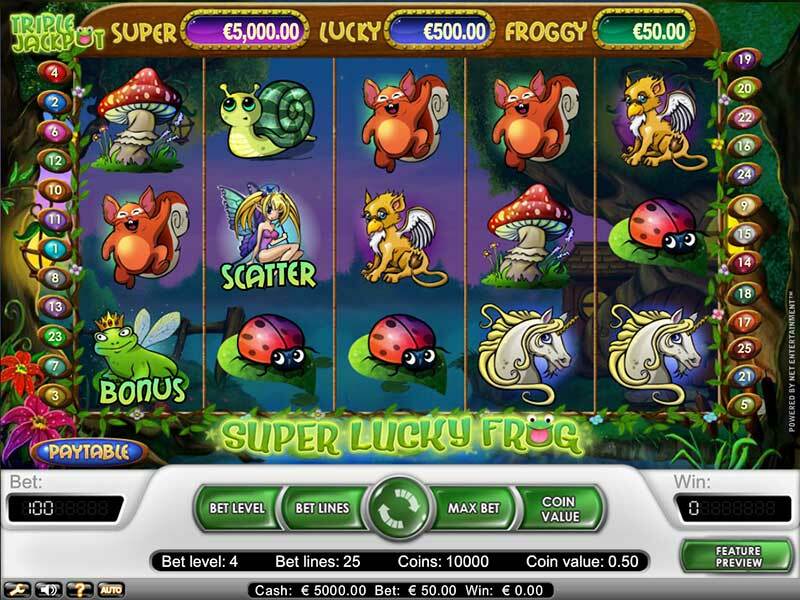 Super Lucky Frog is yet another fun NetEnt slot which carries a huge winning potential. The game features 25 paylines and a fantasy-animal theme so it is hardly surprising the developer has used various fantastic creatures as symbols on the five reels, including the highest-paying fairies, flying frogs and elves. The lower paying symbols in the game are the gryphon, the squirrel, a ladybird, the unicorn, a mushroom and a butterfly. 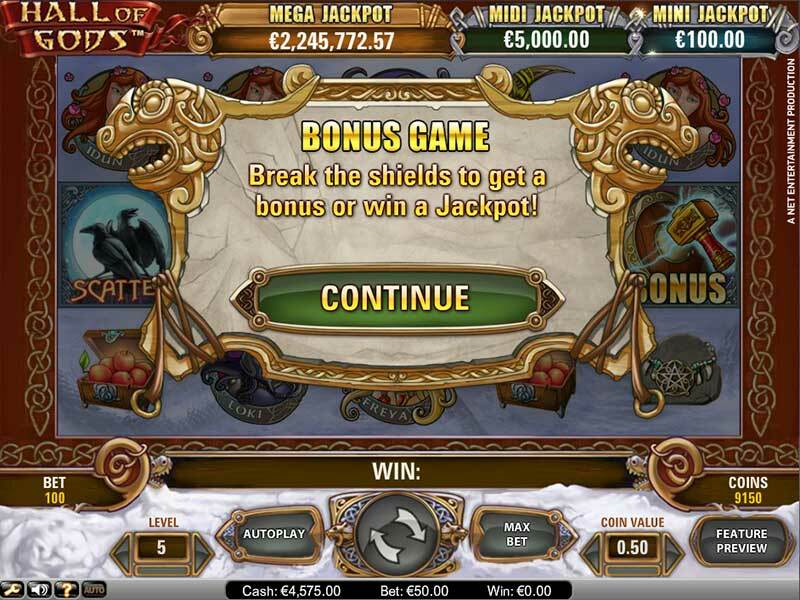 This enchanted-forest slot comes with a number of lucrative features like wild, scatter and bonus symbols as well as multipliers. There are three different progressive prizes you can win – the Froggy, Lucky and Super jackpots. Since the frog is the bonus symbol in the game, players are required to land three frogs on the reels in order to trigger the bonus round. A wheel will appear on a separate screen and you are supposed to give it spin to see which of the three prizes you will collect.